Check Valves are used to restrict the flow of a liquid to one direction. They are used in pumps to stop back flow from refilling the pumping chamber when the pump is shut off. 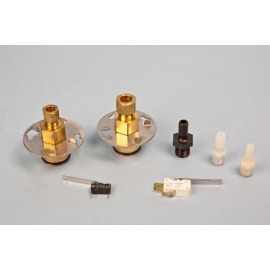 The J-100 safety switch is a water-level sensing device that is designed to shut down the air conditioning or refrigeration unit in the event of a high water level in the pan or reservoir. The switch may be wired in normally open or normally closed position. The kit comes complete with 72'' leads and installation instructions.